Posted on Tue, Nov 8, 2011 : 2:45 p.m. 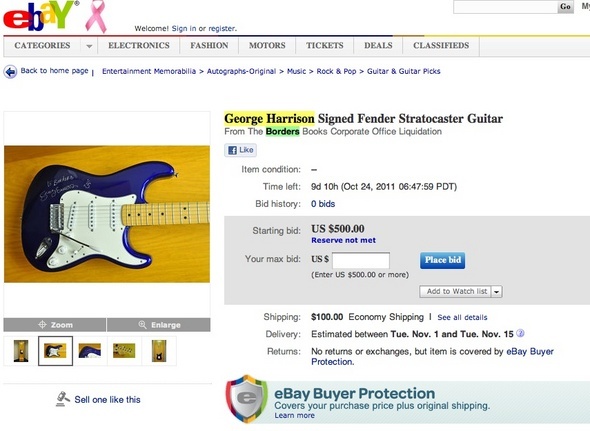 This screen capture shows an expired eBay auction listing for a guitar signed and donated by George Harrison to recognize Borders' role in the reissue of one of his records. When the late George Harrison donated a signed Fender Stratocaster guitar to the Ann Arbor headquarters of Borders Group Inc., the lead guitarist for The Beatles considered the gesture a sign of his gratitude for the bookstore chain's support of one of his reissued records, former employees said. More than a decade later, the guitar, a glass-enclosed fixture in the lobby of Borders' headquarters on Phoenix drive, has been sold — a casualty of the company's liquidation. The profits, like everything else Borders owned, will be pooled and distributed to the company's top creditors. The bookstore chain has closed all its stores and liquidated its book inventory, but some of its corporate property is still being sold off. Jim Shaw, a consultant for liquidator Gordon Brothers Group LLC who is handling the liquidation of the remaining property at Borders' Ann Arbor headquarters, and a representative for Hilco Fixed Asset Recovery LLC confirmed today that the guitar had been sold. Shaw declined to say how much the guitar fetched on eBay. A cached version of an eBay listing that was posted Oct. 24 and summarily removed from the site listed a starting bid of $500. 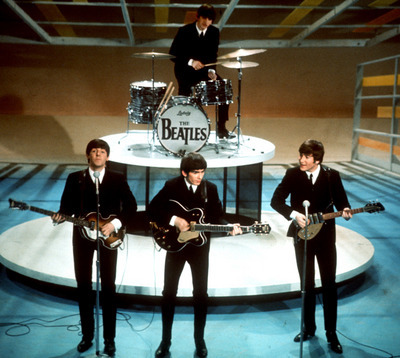 The Beatles' George Harrison (center), Paul McCartney (left) and John Lennon (right) performs on CBS' "Ed Sullivan Show" in New York in this Feb. 9, 1964 photo. "This guitar was a gift to Borders Books from George Harrison and comes with a custom, lighted 2-door lockable cabinet," according to the listing. "This guitar was displayed in the Borders corporate office lobby for many years, but due to the bankruptcy, it is now offered up for auction." The guitar Harrison signed and donated to Borders was manufactured in Ensenada, Mexico from 2000 to 2001. Harrison died Nov. 29, 2001. "George signed a very small number of guitars for Capitol Records a few months before he died," according to an internal Borders newsletter quoted by the liquidators in the eBay listing. "Because of our great relationship and high market share on the Beatles and George Harrison releases, Capitol presented one of the guitars to Borders Group." Susan Aikens, who worked for Borders for 16 years, most recently as a senior buyer leading the children's trade book department, said she "walked past it every day as I went to work." "George Harrison never wanted it to be sold," Aikens told AnnArbor.com today. "It was given to us as a gift as an appreciation. It's just unfortunate because of way the bankruptcy and the liquidation has gone. Everything belongs to the liquidation now." Several former employees of Borders' Ann Arbor headquarters had mobilized to raise funds to buy the guitar before it could be sold off by the liquidators. According to a tally published on a Facebook page for the fundraising effort, supporters had donated $380. Those funds will be donated to a foundation that supports former Borders employees. "It’s my little way of denying the liquidators some profit," she said, before AnnArbor.com discovered the guitar had been sold. Former Borders employee Melissa Towle, who helped to organize the fundraising effort, suggested on the Facebook page that the employees could buy the guitar and "donate it to the (Borders) Foundation, donate it to the Rock & Roll Hall of Fame or donate it to some other great cause, all in the name of Borders employees. This will be a much better solution than it just being another profit for the liquidators!" Shaw declined to reveal the guitar's buyer or the price. He said the liquidators are legally obligated to sell the property for the highest possible price. Wed, Nov 9, 2011 : 5:53 p.m.
the liquidators job is to make money to pay creditors off.seems like a smart move to me. Wed, Nov 9, 2011 : 7:19 a.m.
WOW- First John Lennon's tooth, now George's guitar...I'm holding out for Paul's heart. Wed, Nov 9, 2011 : 3:51 a.m.
Tue, Nov 8, 2011 : 10:49 p.m.
jns, Hello! I don't think he needs it back! Tue, Nov 8, 2011 : 10:44 p.m. Even if it was donated. Did they ask George if he wanted it back? I mean it was his, wasn't it? I have heard of people taking things back if it is going to be sold. Interesting. Tue, Nov 8, 2011 : 11:39 p.m.
Tue, Nov 8, 2011 : 11:14 p.m.
George died of lung cancer in 2001. Don't forget Ringo! He's alive. (I saw him in concert at the Windsor Casino about 2-3 years ago, he's still rockin'). Tue, Nov 8, 2011 : 10:48 p.m.
Re phrase that. When did George pass away? That means Paul is the only Beatle left? Couldn't his estate sue for it back? I think they could. Wow. Didn't realize our bankruptcy laws were that crooked. Tue, Nov 8, 2011 : 9:05 p.m. While sad that it resulted in this, it's not &quot;another profit for the liquidators&quot;. Borders bankruptcy cost many companies a lot of money, and these creditors deserve as much money as can be raised by selling all of the assets of the company. I went to the Borders sale a month or so ago, and it was depressing to see people's tape dispensers, staplers, and other items being sold for $.50 or $1.00, but every dollar raised helps give the creditors back some of what they lost. Remember, creditors are companies with employees that have lives and salaries too. Wed, Nov 9, 2011 : 12:22 a.m. Yes, creditor companies are people too. We need to do all we can to help them, even if it means selling our soul. Tue, Nov 8, 2011 : 9:03 p.m.
&quot;Because of our great relationship and high market share on the Beatles and George Harrison releases, Capitol presented one of the guitars to Borders Group.&quot; Those were great days weren't they? Sales . . . growth . . . flagship stores . . . great potential. If Borders could have maintained great relationships and high market shares, they'd still be here today. The Borders loss is staggering. Loss of an inexpensive autographed guitar is of minimal importance relative to the magnitude of Borders collapse. Tue, Nov 8, 2011 : 9 p.m.
Tue, Nov 8, 2011 : 8:46 p.m. This might have been a more timely story if AnnArbor.com had covered it *before* the guitar was actually sold.